What is Quiet and Raucous at the Same Time that Involves the Entire Community? If you don’t think something can be both quiet and raucous as the same time, then you’ve never experienced this event. The map of Greater Western New York used to be dotted with them every summer, but rising insurance rates have dwindled their numbers to a mere few. The one we honor has the special honor of, for a long time, requiring the consent of the neighboring Catholic to use the parish parking lot for the event, which ran through Saturday night. The only requirement, have everything cleaned up in time for 8am Mass on Sunday morning. Stumped? Then read the answer in Life is a (Small Town) Carnival. It’s happened again. This time, the accolade comes from none other than Smithsonian Magazine. The April 2014 issue of the magazine featured the article “The 20 Best Small Towns to Visit in 2014.” Guess who’s #1? 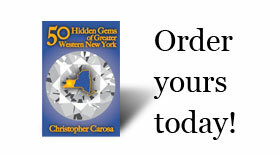 I’ll give you a hint: It’s located right here in the Greater Western New York Region and is one of the “Hidden Gems” highlighted in the book 50 Hidden Gems of Greater Western New York. Can you guess what it is? Take a stab in the comment line below before linking to the article. Good luck!